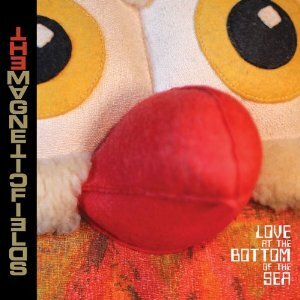 Love At The Bottom of The Sea is a synth-free album by The Magnetic Fields that blends one part acoustic and another part synth-like instruments. While the tracks are short (each of the 15 tracks runs under 3 minutes), the uniqueness of this album runs deep. A great example of the merits on this album is “God Wants Us to Wait,” a tale lyrically about “waiting” in a relationship to get down. The tongue-in-check lyrics are a perfect fit for the band that likes to play around with tunes. “The Horrible Party” has the same feeling but in a different way. The track features a mariachi vibe and moves along so quickly you just have to wait and see where it ends. “Quick!” takes the album in yet another different direction – really lyrically focused indie. It’s reminiscent of The Miracle of 86 and would be a great one to see live. Even “The Machine In Your Hand” is a great time. This one is so much fun and feels like a dance party from start to finish. The Magnetic Fields have put out a unique album — just like all of their prior releases. You won’t listen to this album as a whole and confuse it with any other album. Isn’t originality the best part of music?